The New SWAT-AR riflescope is specifically designed for tactical AR rifles such the M4 and AR-15 carbine rifles. Its compact size and low profile pair perfectly when mounted to a flat-top AR rifle. With the included cantilever AR mount this scope mounts low and ideally forward of the AR’s charging handle. This riflescopes lowest magnification is set at a true 1x magnification that can zoom in to 4x magnification for longer distance targeting. 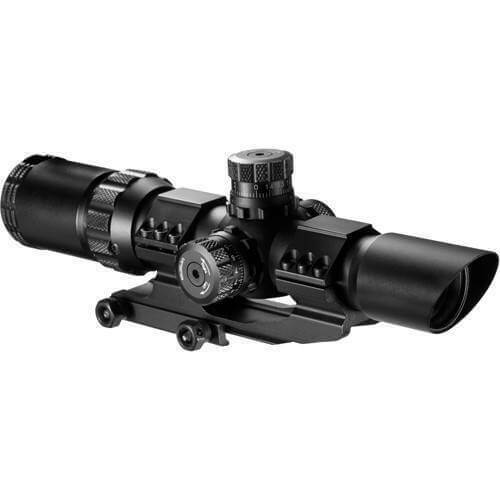 At the 1x magnification this scope can be used in conjunction with your rifles iron sight. The SWAT-AR features external target turrets that can be locked securelyto prevent movement of the scopes windage and elevation. The built in sniper edged sun-shade is set back in the housing to allow the sun shade to cast a shadow and reduce glare for use in bright sun. The glass-etched mil-dot reticle illuminates from black to either red (for low light targeting) and green (for daylight targeting). Comes complete with protective flip-up scope covers. Mounted the scope on an AR build, took it to the range. Was dead on for windage, moved the POI up about 5" and shot dead on from there. Have only fired a few rounds with this scope but so far I really like it. Seems to be good quality for the price. Would recommend to a friends.